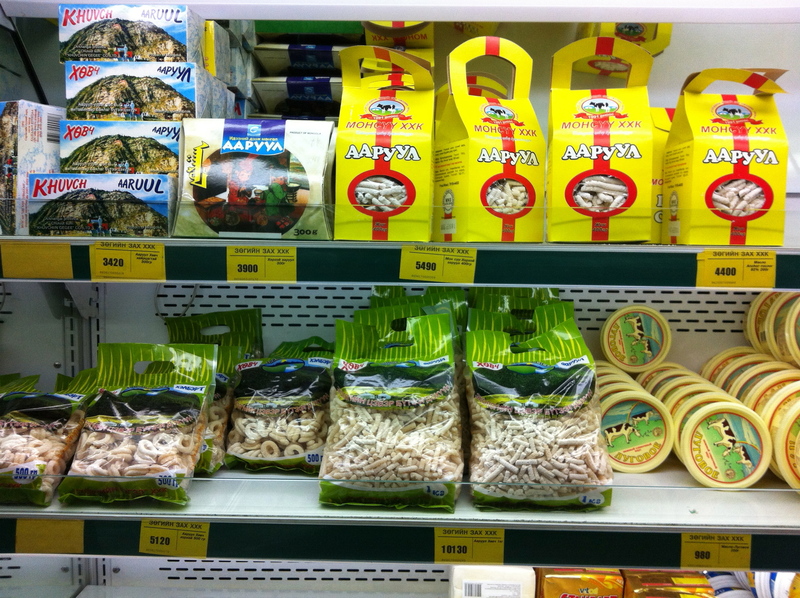 We’ve spent A LOT of time as new expats exploring the grocery stores of Ulaanbaatar. 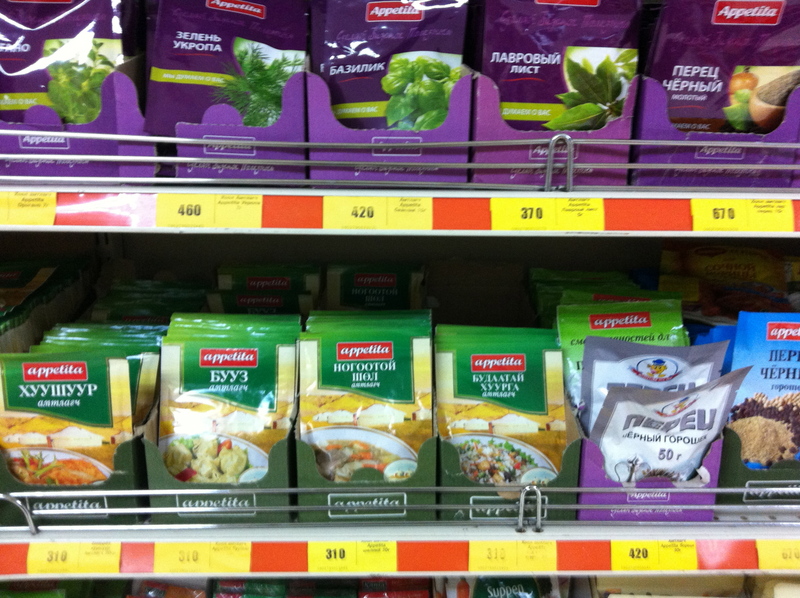 For me, food shopping is one of the most interesting ways to learn about a new culture. What do people eat and how do they get it? 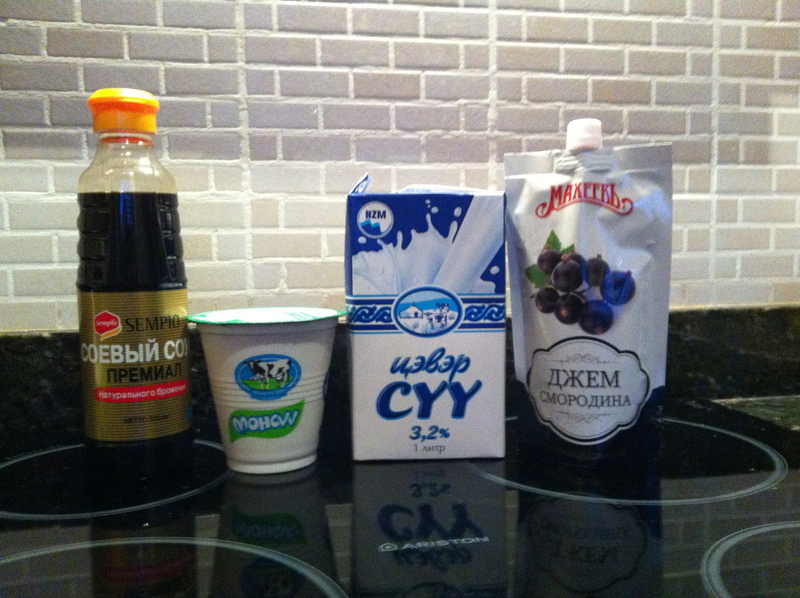 More immediately, what will we eat besides Mongolian food? And where do we find it? 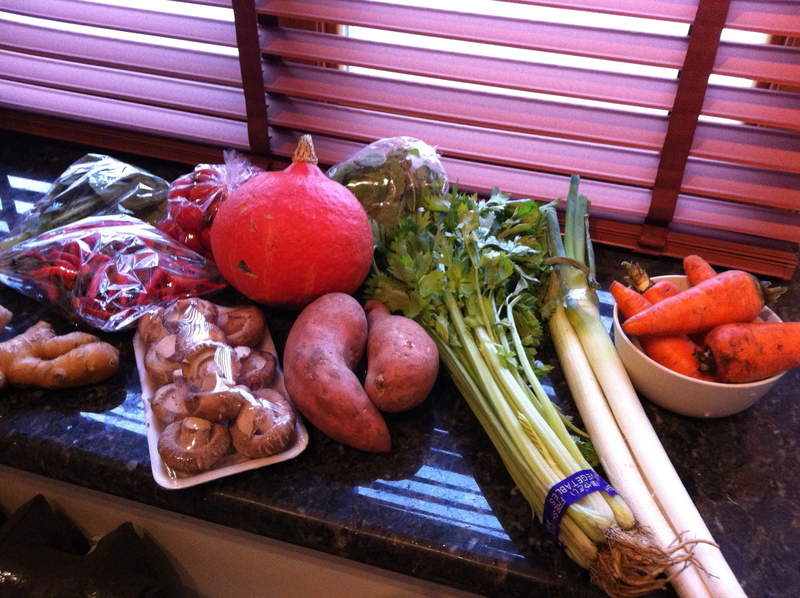 The good news is a lot more vegetables & fruits than I’d expected. Even durian, once! Relatively few vegetables are grown in Mongolia, so what’s here is mostly from China and easily-transported. Leafy greens, such as lettuce, aren’t so good, but there are plenty of root vegetables, as well as tomatoes and cucumbers. Root vegetables are sold unwashed, and sometimes it’s hard to tell the difference between, say, beets and turnips in bins. At left is what we brought home one day — see those nice chilies and the ginger? Meat is sold both in the butcher sections of larger stores and pre-packaged frozen. There are lots of options: cut pieces, pre-ground meats, sausages, and dumplings. (As far as I can tell from the dumpling packages, they’re all stuffed with mutton. Whatever differences there are between red, blue and green labels, it’s not the filling.) Frozen fish also is available. Though I miss eating fish more often, it doesn’t look that good so we rarely buy it. Every store, no matter how small, has a very large candy section, full of chocolates, wrapped hard candies, gift boxes, kids’ treats, you name it. Mongolian food traditionally is not very seasoned. The default seasonings and condiments seem to be Eastern European: pickles everywhere, jars and cans of beets, sauerkraut, and preserved meats. There is lots of oil and what I finally identified as mayonnaise, but very little vinegar — salad is far more likely dressed with mayonnaise than vinaigrette. Korean ingredients also seem very popular, including a wide range of sauces, seasoning mixes, misos, instant noodles, and kim chee. Besides the big supermarkets, there are lots of little neighborhood markets that sell the basics: milk, bread, toilet paper, candy, cigarettes, and, because this is Mongolia, there’s also often a freezer case with big chunks of meat in it. One of my favorite places is the big indoor market where individual vendors sell meat, produce, dairy and pantry items. This is where we find the widest range of produce and the freshest, sawed-off-the-haunch meat, but what’s fascinating are the little stalls of random packaged things. I’m not sure what the import process is for, say, US cake mixes or jars of peppercorns, but these vendors have just different enough stock that I wonder if a lot of it is hand-carried in from other countries. I went looking for horseradish several times with no luck. Pretty much all the stands looked as if they *might* have it, because they had mustard and paprika and ketchup, but no one did. Then, one day, someone had it. It’s like that. Another category is the American stores that sell US brands in big quantities, like a Costco, but in small spaces. Again, it’s hard to predict what you’ll find in one of these, but it’s stuff like paper towels, cereal, baby things, and huge institutional (hospitals, dormitories, prisons) food service-size jars of, say, peanut butter. 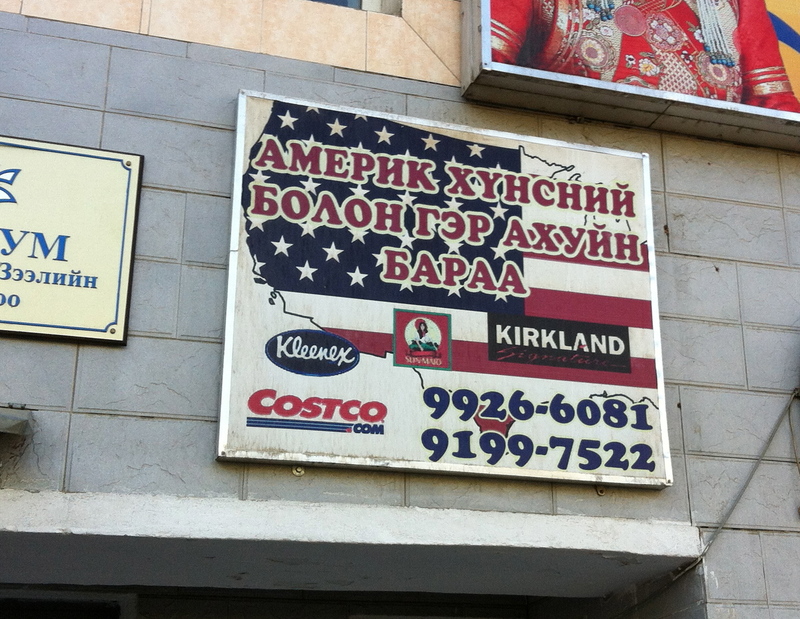 Mongolian people shop there to be sure they’re getting authentic products. I was in a taxi with a colleague and the driver asked her where a nearby American store was, because his wife wanted to buy real US candy for a holiday party. Snickers are at every checkout counter, and it hadn’t occurred to me that they’d be counterfeit, but who knows? Finally, what about that other household stuff? Some of it is easy to recognise, and the local labelling is kind of adorable, like this toilet paper at left. But some things are completely incomprehensible. We bought this bag of whatever back in October, hoping it was laundry detergent but not sure. Laundry detergent? Fabric softener? Dishwashing liquid? Bird shampoo? We tried looking online, then emailed a photo to a Korean-speaking friend in the US. 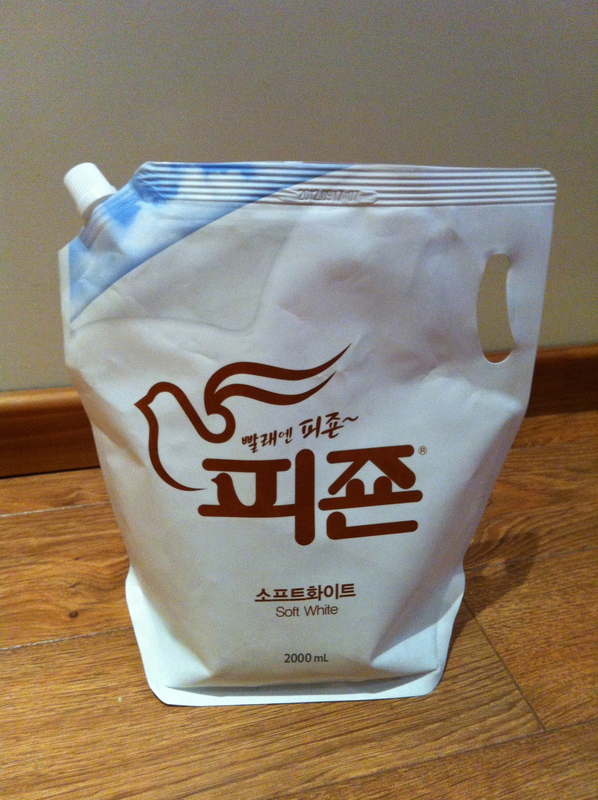 The label turned out to be too euphemistic for her non-resident Korean language skills — the label and product name, “Gentle Pigeon” or some such, didn’t actually explain what it does, so our friend had to forward the photo to a cousin in Korea for further explanation. Turns out to be a very popular, heavily advertised … laundry detergent. Thank you for posting. Loved your commentary and pictures. 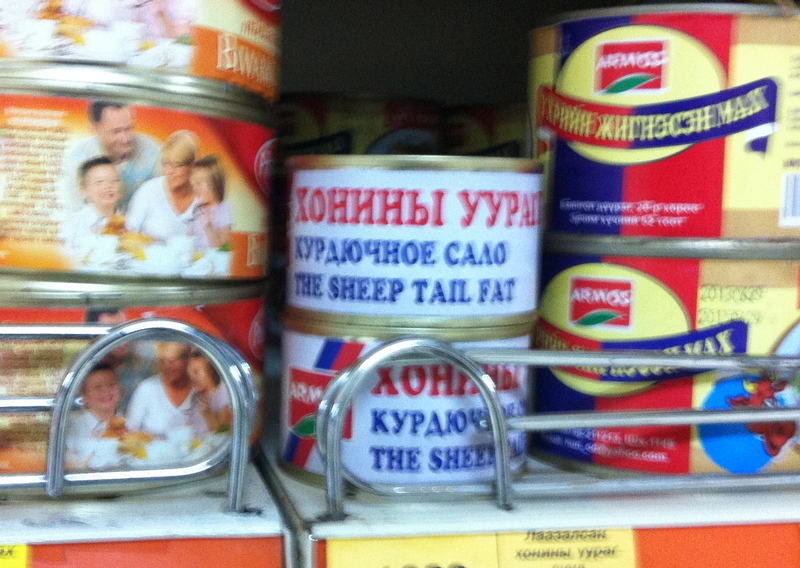 The Sheep Tail Fat. Wow. Need to just think about that for a moment. Love this post, food packaging tells you as much about a people as the food they eat. Yes! 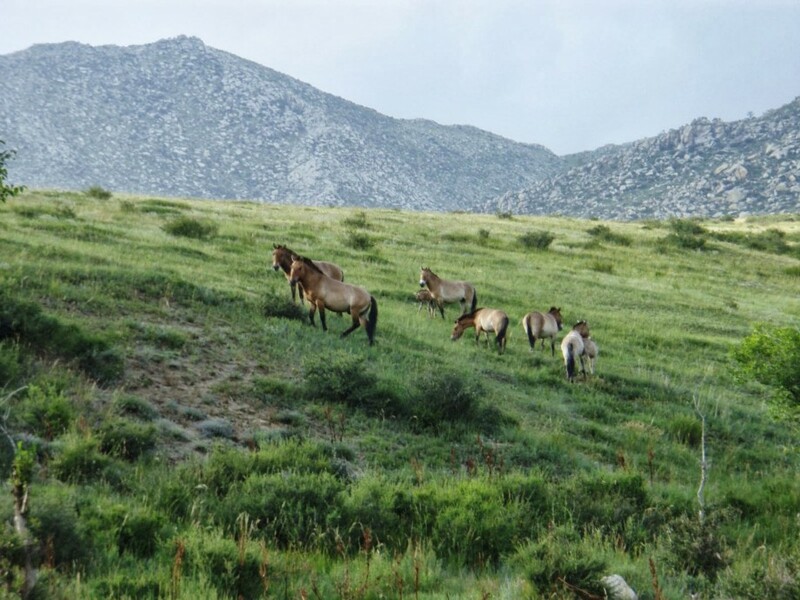 And a big part of the story here is how much comes from outside Mongolia. Quite the challenge you have there. I guess using a Mongolian dictionary would not suffice if product is also coming in from china, korea, etc and not specifically labelled for the mongolian market. Wow! No spices! That Korean red pepper is a nice one to have on hand.Funny that dried yoghurt you describe sounds like an extreme form of greek yoghurt. I take it you eat it as is and do not try to reconstitute it in some way. Have you tasted it? and what about that Durian? Did you like it? I could never get around the smell and texture to taste it myself (reminded me of bananas which i have some unexplained aversion for). Hang in there! You are sure to become the master of the market! I have eaten ahruul a bunch of times, and it is very hard to chew, not that tasty. 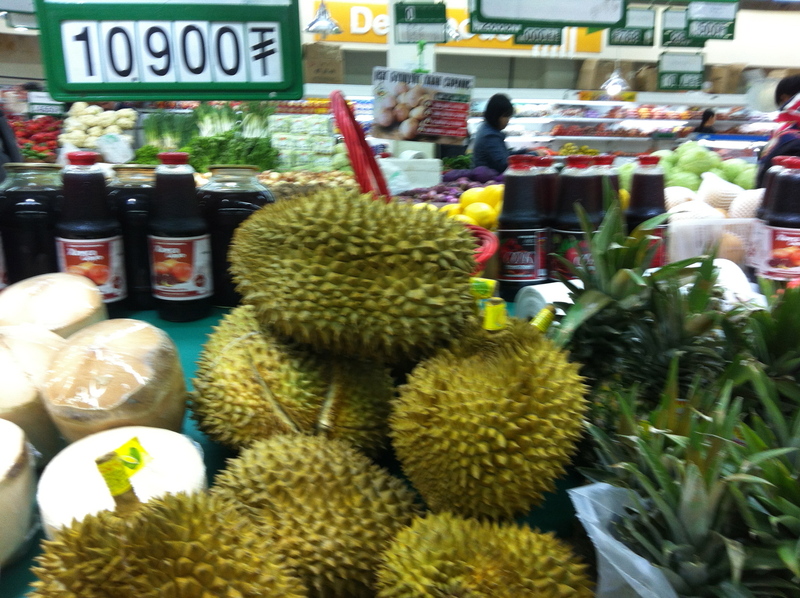 To me, anyway — I very much prefer durian to dried yogurt! I am amazed and impressed with your courage in tackling this grocery shopping task! I know you kind of have to, but it looks pretty intimidating to me. I am 66, going into the Peace Corps, & asked to go to Mongolia. I spent 20 years on Native Am. rez in South Dakota. Monglia seems very familiar. Thanks for all this helpful information. I’m working on moving from South Korea to Mongolia to teach English. Trying to figure out what Korea has that Mongolia maybe doesn’t and that I like to have on hand. There are MANY products from Korea here, not only grocery items but also cosmetics, household goods, office supplies, etc. If you prefer smaller brands or more niche items, then you might want to bring them, but mainstream Korean brands are easy to find here. Also, Incheon is one of the most common flight transit points in and out of Ulaanbaatar, so you will likely spend a lot of time there on layovers and can pick things up then. We are two expats and a cat who moved to Mongolia in September 2013 after five years in Malaysia. We’re here for work in the development field, travel and adventure, open to exploring what this fascinating country has to offer. 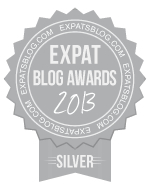 Thanks to ZZ Packer's Drinking Coffee Elsewhere for inspiring the title of the blog. All photos are by us unless otherwise noted. Give me all the lamajoon you have. What I'm worried you heard was "give me a lot of lamajoon." What I said was, give me all the lamajoon you have.